Icelandic skin care now at Clarity Medspa in Toronto! Skin specific Serums, Volcanic Exfoliators and Eye Care 2nd to none. Internationally acclaimed & Award-Winning SERUM that delivers visible and dramatic improvements to the skin. Delivers skin-rejuvenating results to all skin types. An advanced anti-ageing serum that delivers multiple anti-ageing benefits during daytime use. Improves skin tone and texture, restores the skin’s moisture balance and provides a smooth finish. Easily applied, the soft and gel-like BIOEFFECT EGF DAY SERUM absorbs instantly, leaving a smooth texture, perfect for applying make-up. Powerful, revitalizing anti-ageing formula, specifically developed to target the delicate eye area. Outstanding anti ageing serum, with a unique combination of three cellular activators, that cannot be compared with any other product on the market with regards to efficacy. The three cellular activators, EGF, IL-1a and KGF, are naturally found in high concentration in younger skin, and act in synergy on the two decisive layers of the skin, the epidermis and the dermis. EGF and KGF work in synergy on the outer layer of the skin renewing its texture, increasing radiance and improving skin. EGF and IL-1a work in synergy on the inner layer of the skin, increasing its moisture, and improving the skin‘s elasticity and strength. 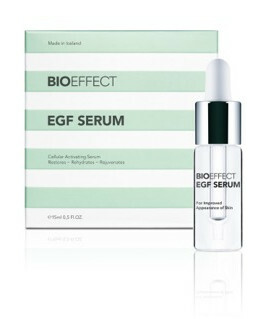 BIOEFFECT 30 DAY TREATMENT is formulated with highest concentration of EGF to boost and accelerate results. 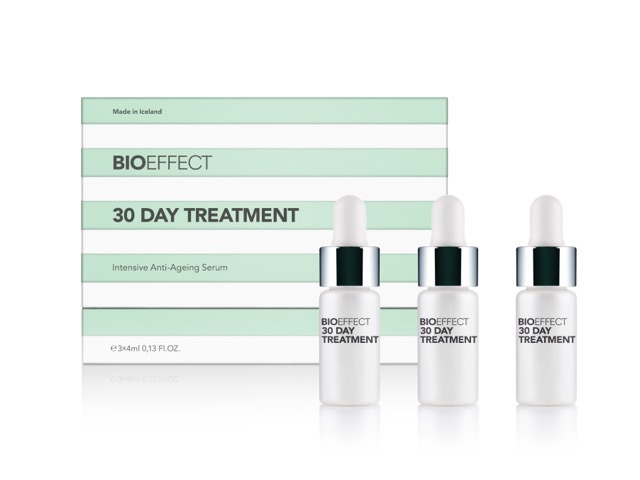 BIOEFFECT 30 DAY TREATMENT is the first and only skincare product to contain three different types of cellular activators copied from human skin and made in plants. Use 1-4 times a year, depending on the skin‘s condition.